Apologies for another long absence here – and thank you so much for all your kind words and prayers on my last post, I’m very grateful for your support. My trip to Japan was a very emotional one, but I’m glad I went back to see what is really happening through my own eyes. It’s already been a year since the earthquake – some things are back to normal, but in most affected parts there are still thousands of people who need both short and long term support. I’m organising a Japan fundraiser at the moment which I’m hoping to launch in April through my blog. It will be a raffle full of wonderful foodie prizes, so stay tuned and I hope many people can help to raise money for those who still need help. I went to Athens last autumn to shoot for a wonderful olive oil company called Esti – I had been working with them for a while and the lovely owner George asked me to come and shoot around the city as well as shooting for his wife Ada’s beautiful Fresh Hotel. It was my first time to visit Greece and I only had a few days in Athens – sadly when I was there, many strikes were going on because of the economic crisis, so I had to shorten my already shot stay otherwise I wouldn’t have been able to fly back :( There certainly wasn’t enough time to fully explore, but I really enjoyed staying in the city full of rich history, lovely people, and of course beautiful food. I was particularly excited strolling through the central fish and meat market which is just around the corner from Fresh Hotel – it was vast and great fun to explore. Everyone at the hotel looked after me well, not to mention George, Ada and all the people from Esti. but I found that a little too sweet for my taste; at Fresh Hotel, they serve it with semolina custard inside, along with red wine poached pears and vanilla ice cream -it was divine. I asked the chef for the recipe which he kindly gave me – then Ada also kindly translated it for me :) Ada also bought me some Kataifi pastry to take it back – I recreated it at home slightly changing the recipe by adding Marsala poached pears and turron ice cream to go with it, it was really lovely. I’ll post the Kataifi recipe sometime, but I wanted to share another recipe today that uses Esti’s beautiful olive oil. A few years ago, George and Ada bought the traditional olive oil company which was established in 1912, in Kalamata – well-known as the region where the highest quality of Greek extra virgin olive oil is produced. Theirs has quite a distinctive aroma of apples and bitter almonds which I love, and when I tried frozen yoghurt drizzled with extra virgin olive oil and sprinkled with flaky sea salt at a restaurant in Tokyo, I thought their oil would be wonderful for this. This is barely a recipe and you may be put off by the combination, but believe me, it’s delicious! The lightness of the yoghurt really brings out the flavour of the oil and salt. You can use any extra virgin olive oil, but be sure to use the best you have. Mix together the yoghurt and sugar until the sugar is dissolved and refrigerate for about an hour. Churn in an ice cream machine according to the manufacturer’s instructions. Serve with sprinkle of flaky sea salt and a drizzle of extra virgin olive oil. Fabulous photos of Athens Keiko. I have not tried this frozen yogurt dessert. It sounds delicious. This post is beautiful, and the perfect point of re-entry! The Esti packaging is very attractive, I’d like to get my hands on some of it. Your lovely photos transport me to Athens, where I was born but had to leave shortly after my birth. Thanks for the equally stunning food photos, and the easy recipe. Will be on the lookout for more news about your Japan fundraiser. Your pictures are enough to give anybody wanderlust. Not that I’m not afflicted anyway. Best luck with your fundraiser. I was in Minami Sanriku in October, and feel the affected areas still can use all the help they can get! Your photos are beautiful. I shall try esti next time I’m buying oil. And the frozen yoghurt photos are divine. Looks like a great trip! Each and every of your posts is a precious gift for me. I’m quite excited that you plan to be posting more. I am lucky enough to have a fantastic olive oil made by my father in law. The combination does sound unusual, but I totally trust you, and I can’t wait to try this dessert to showcase the oil. Welcome back Keiko! Glad to hear that things are getting better in Japan. Are you in Bury for a while? If you have a tiny amount of time I’d love to meet up and have some advice from you. Possible? Keiko, so good to see you posting again – fingers crossed for lots more beautiful travel posts this year, have missed your posts. Oh… those pictures made me feel nostalgic! I read your blog and I find it gorgeous, really. I can’t see the time to see your first spring posts. I whish you all the best! Oh wow! We have a fabulous store that carries so many flavors of olive oil. I definitely have to buy some to try this. Hope you’ll visit us again soon when things will get better! I am from Athens and I just love seeing your beautiful photos of my city, Keiko! Too bad you had to experience the infamous Greek strikes. Hello there! Lovely pictures from Athens! Funny that the name of your blog is Swedish! Nordljus means North light or Light from the North, how come? It was very funny to see the Swedish name of your blog and all these nice photos from Athens as I’m Swedish living in Athens! Such a short time in Athens but you still managed to take some many lovely photos. As always, I love that these reports of your’s almost always have some cat photos. :-)) Looking forward to the raffle. Keiko – Your photos and styling are beautiful. Can you tell me what the name of the china pattern is on the photo’s with the yogurt? The china is lovely. Keiko darling, let’s catch up. Would love to see you. 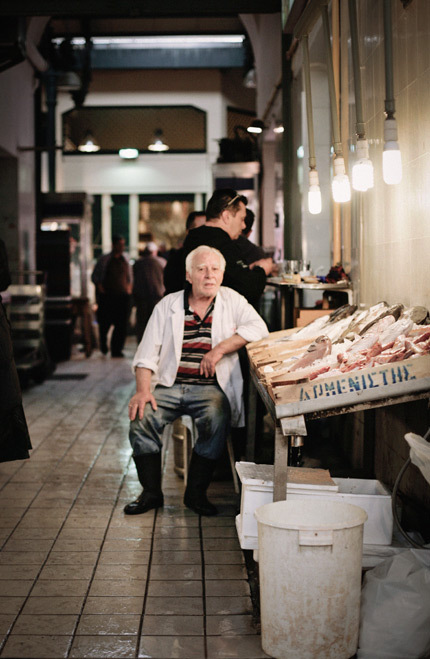 Loved the picture of Athens, I really enjoyed walking around the area around the market. Look forward the raffle in April. I’m totally in awe of your work! I admire the way you capture subtle beauty in your photography. I really enjoy visiting different counties through your lens. Thank you for sharing! I’ve been dreaming about Greece for a while now, from when I used to study ancient Greek and Greek literature at high school, or, more recently, when I fell in love with Greek food, but I’ve never been able to go there. It’s in my to-do-list, though, and I hope this will be the good year! Thank you for these amazing pictures, it is exactly how I imagine Greece! I found your blog through La Tartine Gourmand and Lara Ferroni! I LOVE your blog – your style, the mood, the scrumptious foods! Definitely bookmarking you! I miss Athens, too. When I visited, I didn’t think I’d like the place, but I actually ended up liking it… Miss it dearly…Sigh…! wishing I was there with you. Beautiful pictures! I want to go to Greece right now. I love everything about your beautiful blog. Thanks for being such an inspiration. I really love to follow your trips with your splendids pictures! Gorgeous photographs…you could take pictures of a cardboard box and still make me hungry. Thanks for sharing your inspiring eye with us. Your images tell wonderful stories. Thanks! 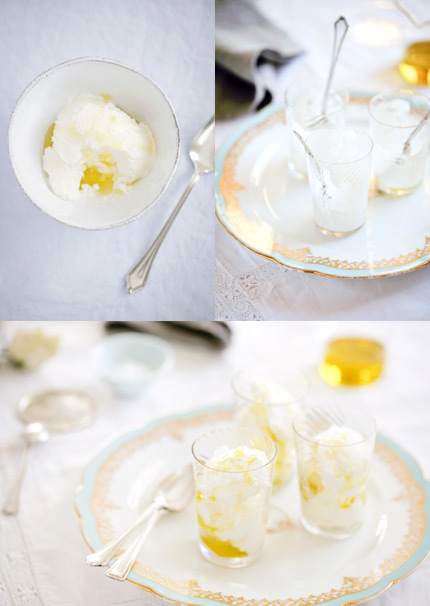 Frozen greek yogurt with olive oil and salt sounds like a delectable combination! As always the photos are gorgeous. It is so inspiring to see your postings! I’m sorry you had to shorten your stay in Athens because of the demos. I’ve never tasted frozen yogurt with olive oil and sea salt! That sounds intriguing! I was thrilled to stumble upon this post; I’m going to Greece this summer—to Athens and Thessaloniki—with my boyfriend (who is Greek) and this reminds me of how much I have to look forward to in June. The photos are lovely and I’m bookmarking the recipe to make immediately. Just consider it the first of my travel preparations! 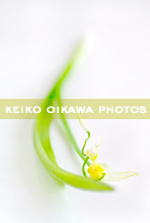 Hi Keiko, wonderful work as always. I’ve been a follower of yours since 2008 and always find your work has some kind of calming effect. I’ve been at the receiving end of lots of bad news lately and whenever I need a momentary escape from the real world I find refuge in your work. Thank you. I feel a little ashamed for I’ve never met your works until now. It’s full of grace. Thank you! What wonderful photographs and places! I’d liked them Very much. Beautiful in all regards. I love kinafe..thanks for the photographic tour. Wonderful!!!!! What an inspiring trip! That’s something new, it sounds different, but it looks beautiful, I have to try!! Have a nice day. Really beautiful photos!! As everyone else has commented, they are truly inspiring! What beautiful, evocative photos. Love your blog! I’m a new food writer. Please check out my ideas when you have a chance at http://vespawoolf.hubpages.com/. So wonderful to see my hometown in your blog!! I’m glad that you had a chance to look around the market in the city, one of my favourite places to go when I’m visiting. Makes me even more homesick now!! I have been following your blog for a couple of years now and it’s always a delight to look at your pictures. I hope this note finds you well.You have one of the most beautiful blogs and I am an old fan of yours. On another note, since you have one of the oldest blogs and know everybody would you by any chance know what’s happened to the blog A la cuisine? I only came across it by chance and was sorry to see that it had stopped being published since 2007. I found your fabulous site via WKA (what kate ate blog) and now my cup runneth over with delight, twice! I just love the fact that the universal sharing of food, travel, knowledge and culture overcomes a lot of the negativity that abounds. I recently discovered your website and I have to convey at how beautiful your photos are. You have a great eye for photography and I look forward to following your blog with much enthusiasm. This is my first time to your blog. Your pictures are incredible, you do a really good job. Please let me know when you get your fundraiser put together. I would like to help and spread the word. this sounds very good. i’d love to try that olive oil. Those photos of Greece look simply superb! Even inside the fish market, the lighting looks perfect. Can’t wait to see more. Wish you a wonderful holiday season. very much inspired, I’ve fallen love with this beautiful blog! Hi Keiko – Happy New Year to you! Your website brings joy to many folks, so I hope you can start posting again.